Nearly equidistance from Baltimore and Washington DC lies the village of Savage, Maryland, the home to American power metal band, Burning Shadows. (If they get tired of their current name, they could rename themselves to their hometown. That would be metal.) The sextet returns with their third album, Truth In Legend filled with tales of fantasy, history, mythology, and video games. The title cut is based on Skyrim, from the The Elder Scrolls series, developed by Bethesda Game Studios located, interestingly enough, just west of Savage in Rockville. Enough with introduction, and on to the music. 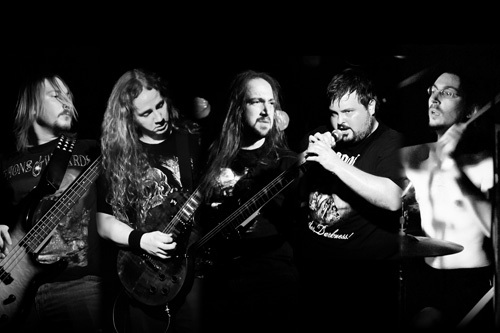 Burning Shadow works from the fundamentals of classic "keep it truth" heavy metal, and then simply adds swiftness and speed for power metal. Their sound is a hybrid of American, British (NWoBHM), and continental European styles. 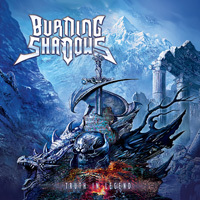 In other words, if you like Iced Earth or Twisted Tower Dire, Iron Maiden, or Blind Guardian, you will like Burning Shadows' American power metal. Moreover, to present their music, and not unlike Iron Maiden, the band includes three guitarists for, not twin, but triple guitar harmony and the offers two lead guitarist. Expect a guitar-forward album and songs, and you get it with Truth In Legend. Riffs rule and solos are abundant. After this, the speed of power metal comes from a sturdy and swift rhythm section. Yet with that gallop you will also hear sufficient groove as well. Vocalist Tom Davy has a solid heavy metal voice. Singing melodic and clean, he can be assertive or soaring as needed, and keep pace when the metal becomes racing. As for the songs, they're all basically killer melodic heavy power metal tunes. Let's throw the spotlight on a few. One favorite was From The Stars, which begins with acoustic guitar, then twists in an electric solo, before turning into a true speedy power metal rush. The Blessed is a heavy metal anthem, with Davy's vocals over acoustic guitar at the start. But traveling along the more guitar riffage and solos rise. Finally, and also the last song of the album, Deathstone Rider allows Burning Shadows to stretch for a 13 minute power metal epic. The song twists acoustic and electric guitar together (as in other songs), juxtaposes moderate and lighter parts with the heavier and faster, adds some light synth orchestration (notably at the end) and, of course, bristles with solos. All in all, with Truth In Legend Burning Shadows remains a constant and consistent, creating exceptional "keep it true" American melodic power metal. Easily recommended. With Truth In Legend Burning Shadows remains constant and consistent, creating exceptional "keep it true" American melodic power metal. Easily recommended.